Summer time is just around the corner and sandals are on every girl's shopping list. But with the dry season harsh on everyone's feet, try adding a special stone to that shopping list. 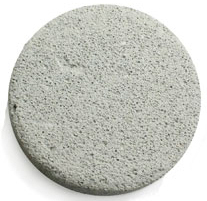 Natural Pumice stone has been used for centuries by Arabs to achieve beautiful feet before pedicures ever existed. Pumice stones are rubbed across the bottom of the foot in order to remove dry and excess skin from the bottom of the foot as well as calluses. It was also used by the ancient Greeks and Romans as a way to remove excess hair. Fortunately with our ever networking society, natural pumice stones can now be found at every beauty supply store and Arabs aren't the only ones who know the secret to beautiful feet. They have now been widely used in pedicures and have been on the shelves of major salons. It's also a major time and money saver. If you can't head to your weekly pedicure session, take out five minutes of your time to use the natural stone. Not only will the bottom of your feet feel super smooth, but you just saved yourself some cash. Pumice stones can be found in any local beauty or grocery store ranging from 3 to 10 dirhams and it's natural! Have you tried this? Would you try it? Let me know!